Long story short, Nintendo didn't think through a contract with Sony by Hiroshi Yamauchi, then-president of Nintendo. The contract gave Sony all profits for a potential CD-ROM add-on which was being developed by Ken Kutaragi. Yamauchi didn't like the deal, but instead of telling Sony that and drawing up a new contract, he instead went with Phillips to develop an alternative CD-ROM add-on for the SNES... a deal which also imploded (resulting in Phillips' split with Nintendo for their own standalone CD-ROM "multimedia" set-top, the CD-i; a messy legal battle also gave Phillips the rights to some of Nintendo's franchises, resulting in the infamous Zelda and Mario CD-i games), and caused Nintendo to spurn both the 32-bit era and the CD-ROM format. Sony, meanwhile, was reluctant to get into gaming, but that move lost Sony face. So Sony had to get into gaming to reclaim its honor. Thus the PlayStation as we know it was conceived. 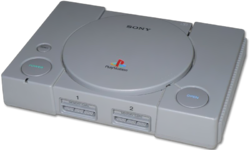 Sony redesigned the "PlayStation X" from a fancy CD drive for the SNES into a full-fledged console. Developers were getting excited by 3D gaming, so Kutaragi designed the system with that in mind. He also made sure it was easy to develop for, so programmers could get their 3D system right out the gate. Sony also had, by far, the most developer-friendly license in the industry, with low royalties and no "our console and nobody else's" restrictions. This made the system extremely attractive to developers. Combined with great early sales and the larger profit margin, it attracted many developers, and thus began two generations of PlayStation dominance. However, in North America, the PlayStation had a rocky start. Sony hired a certain Bernie Stolar as head of Sony Computer Entertainment America, the North American arm responsible for licensing content and developers for the PlayStation. Stolar's Executive Meddling, specifically vetoing many JRPG localization releases for the PlayStation in North America and prioritizing sports titles, almost lead to the PlayStation failing in the market. Sony quickly caught on and booted Stolar and voided his policies. The PlayStation began to thrive in the US once other game genres began entering the market soon after Stolar's policies were removed, and with the release of Final Fantasy VII the rest is history. Meanwhile, Stolar went over to managing Sega of America...and we all know how that turned out. Incidentally, only the smaller redesigned models usually display the words "PS 1"/"PS One", given that they were released late in the console's lifespan with its successor, the PlayStation 2, on the horizon, thus there was a need to differentiate it from its impending successor. Though Sony has kept the PS One designation for its downloadable "PS One Classics" line. A Vector Unit called the "Geometry Transformation Engine", built inside the CPU. A full-fledged GPU. Although the CPU/GTE rotates and translates the polygons; the GPU rasterizes and shades them. 2 MB main RAM, and 1 MB Video RAM. Bandwidth has a maximum of 130 MB. 512 KB of SRAM memory for sound with BBR compression. 32 KB CD buffer,used for commonly accessed sectors of the disk. Theoretical polygon count is 1,000,000...but that's assuming the processor is making nothing else, so it isn't helpful. In real-time games, the count would be around 100,000 to 120,000. A few games reached 150,000 polygons a second, which comes out to around 3,500 polygons per frame at 30 fps. As a comparison, this is about 1% of what the Play Station 3 can push. Textures were high quality for the time, and could have quite a bit of detail. Unfortunately, the system lacked filtering for the textures, which meant that high-contrast textures would look blocky up close. Nor was it able to do texture mapping well; due to the use of affine texture mapping (no accounting for perspective) textures generally appear to warp and twitch when the camera moves. Some developers came up with tricks to minimize these effects, but in the main it was just something that PlayStation owners got used to. Finally, despite both the vector unit and rasterizer working with fixed-point mathematics (not as good as an FPU, but much better than nothing), only integers could be passed between the two, leading to the slightly stilted movement of polygons that typify PlayStation graphics (Watch any slow-moving object and you'll notice how the polygons seem to "snap" to each new position, rather than moving smoothly). Dual Shock: Since the Playstation was developed as a 3D system from the start, having three-dimensional control in its games would be vital, so the original Playstation controller design featured not one, but two pairs of shoulder buttons for three-dimensional movement. Eventually, however, Sony responded to the Nintendo 64's analog controller and rumble feature by incorporating force feedback and dual analogue sticks into the new controller. This controller design would later serve as the basis of all Sony first-party gamepad controllers, ranging from the PlayStation 2's Dual Shock 2 (with analog, pressure-sensitive face buttons) to the Playstation 3's Six Axis and Dual Shock 3 (the former of which added motion-sensing abilities at the cost of force feedback, and the latter of which brought rumble back). In the US, Nintendo tried to sue Sony for adding vibration and analog capabilities to the controller. Nintendo lost the case because this didn't violate their patents. Immersion later did successfully sue them because it did violate their patents. Dual Analog: Actually preceding the Dual Shock, the Dual Analog controller shared the same buttom placement as its successors but distinguished itself with its longer grips, concave sticks, ridged shoulder buttons and an additional compatibility setting for games that supported the little-known analog joystick. It also lacked rumble outside of Japan. Link Cable: A peripheral allowing for playing games with multiplayer modes without the need of Split Screen. However, it has two issues — 1) a set of 2 TVs, 2 Playstation units, and 2 copies of the game are required, and 2) the cable isn't compatible with the redesigned PSOne. About 30 games are compatible with the Link Cable, among which are the Armored Core series, the Wipeout series, TOCA 2 Touring Car, and Final Doom. Net Yaroze: Sony's gift to bedroom programmers all over the world, the Net Yaroze (Yaroze being Gratuitous Japanese for "Let's do it") was a one-of-a-kind development kit marketed to computer hobbyists as a chance to create their own PlayStation games. The $750 package included a special region-free black PlayStation console, manuals, instruction books and software to get users started, although users had to supply their own computers and programming skills to create software for it. Usually these games could be submitted to Sony to be published on the demo discs of Official Playstation Magazine. While most of the games produced with the Net Yaroze were fairly amateurish clones of commercial games such as Doom, Puzzle Bobble and Pac-Man (one Doom clone going so far as to hang a lampshade on it by calling itself Clone), some of them were surprisingly ambitious (such as the Zelda-like RPG Terra Incognita). Although future Sony consoles have not featured similar in-depth homebrew options, it's possible to run distributions of Linux on both the PlayStation 2 and, until a firmware update released after the redesigned model, the Play Station 3, and the demo disc that comes with the PlayStation 2 features a YABasic programming tool. PlayStation Mouse: A peripheral designed for games with mouse-friendly (or required) interfaces, such as Real Time Strategy games (Command & Conquer series), Point & Click Adventure games (Broken Sword, Clock Tower, Discworld), or FPS games (Final Doom, Quake II). About 50 games, a number of which being Japan-only, are compatible with the Playstation Mouse. A Tokimeki Memorial-themed mouse was issued as one of the goods of the Tokimeki Memorial 1 Limited Edition Box. Pocketstation: The Pocketstation was Sony's first handheld gaming system, despite it not even being its own console. Instead, it was sold as a memory card peripheral with a Tamagotchi-like design, featuring a small monochrome screen, a directional pad and an action button, which could be used to play small minigames transferred to the system from its parent console. The system itself never saw release outside of Japan, but some globally-released Pocketstation-compatible games retained their compatibility with the system, including Final Fantasy VIII, where the Pocketstation game Chocobo World was included as a bonus in the PC port. This page was last edited on 17 July 2018, at 15:55.